A 10-year-old Bexhill pupil took charge of the White Rock Theatre for a day after wowing judges with a piece of creative writing. 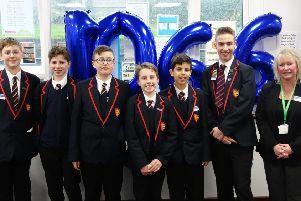 George Killick, from Pebsham Primary Academy, joined hundreds of other pupils in the county to take on a creative writing challenge set by the educational charity Inspire Schools, in collaboration with Sussex Newspapers. Their task was to write a persuasive letter to encourage their best friend to walk to school with them. George’s letter was packed with detail about the health and environmental benefits, but also stressed that walking to school together would give them an opportunity to strengthen their friendship. The prize for impressing the judges was taking charge of the White Rock Theatre in Hastings for a day, allowing theatre director Gavin Shuman to take the bulk of the day off. George said: “I really enjoyed my day in charge. “It was amazing to see behind the scenes at the theatre, get experience in the lighting and technical box and actually serve customers their theatre tickets. Inspire Schools CEO Simon Dolby, whose charity runs the reading reward scheme Buster’s Book Club, said: “I am so grateful to all the staff at the White Rock Theatre for making George’s day so special. As well as this newspaper, Buster’s Book Club is supported by Drusillas Park, Freedom Leisure, 3D Recruit, Sussex Community Foundation, Orbit housing association, East Sussex County Council and Brighton Sealife Centre. To find out more, visit www.BustersBookClub.co.uk. For more information on inspire Schools, visit www.InspireSchools.org.uk.